As a church pianist, I think it’s helpful from time to time to focus on your artistry. I know the church pianist serves a purpose, and it’s important for us to consider our role as servants in the church. (I do believe people are called to serve, and all Christians are “wired” with ways in which they serve the church. There is great value to servant-hood, and it’s a broad Scriptural principle.) But to maintain merely a utilitarian view of our position is to miss out on opportunities to be creative and artistic. A couple of preliminary thoughts. First, make sure your leadership is on board with your ideas. This also means you need to clearly and precisely communicate your ideas. Don’t just do some of these “tricks” without informing anyone; that would not be wise. Further, know that change is sometimes difficult to implement, and can often be met with resistance. This is not a blog about change in the church, but I’m sure there could be entire blogs devoted to the subject. Just use your wisdom, and the combined wisdom of your peers, team, and leadership. In most of the examples below, I would recommend that you showcase or demonstrate what you have in mind–in detail–so that everyone is on the same page. Maybe you just have a CD play; spice it up with live musicians. Maybe you just play a bunch of hymns in the hymnal; change it up with some modern songs, or a variety. Maybe your church likes a lively prelude as people enter; consider throwing in one meditative song, perhaps in the middle, that might help people to reflect and pray. Add instrumentalists. Have an acoustic ensemble. Incorporate a student ensemble. Do something out of the ordinary that says you’re being intentional about all aspects of your corporate worship. Tying your songs together with seamless musical transitions helps create momentum and a sense of direction. Including the lyrics on the screens or in the bulletins best facilitates this, but it can also be creatively achieved by using a hymnal. Some modern hymnals contain a few ready-made medleys available for use. Even if you have to spend time writing out your transitions, it will be well worth your time. Provide background music for segues and prayers. Sometimes, dead space is appropriate. But sometimes it’s helpful to include music to help transition, or to provide an atmosphere of thoughtfulness or reverence. Of course, we don’t “create” worship. But in the same way that a full orchestra aids in worship, or an organ or a guitar aids in worship, so can our keyboard artistry. Use simple, whole note chords and progressions. Don’t have distracting melodies, that might actually compete with the speaker or worship going on. Introduce a poignant instrumental solo or ensemble. At our church, we normally have an instrumental during our offering. It’s just been our tradition that has worked well, and it certainly gives a lot of our keyboardists and instrumentalists ample opportunity to serve. Perhaps you do too. But what if your instrumental was placed strategically at a location that really made people think. You could include some of the lyrics on the screens or in the bulletin. Especially if it’s thoughtful, and especially if it works well with the progression of the song portion of your worship service, this could be very effective. Provide thoughtful invitation or response music. Yes, our church still has an altar call. 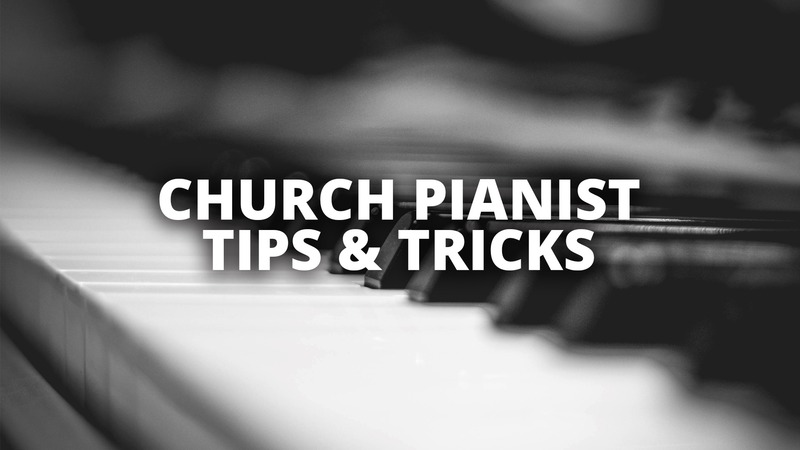 And if your church still utilizes a church pianist, there’s probably a good chance that you have one, too. Let’s not do a raise of hands, but many of us have sat through a boring, repetitive invitational played while the pastor prays, or calls the congregation to some sort of response. Why not play quiet, contemplative, and simple chords under the final invitation. An invitation hymn could be alluded to, but not outright played. And I’ve found playing at a much slower pace significantly helps the time to be more thoughtful and reflective. Your service in the local church as a keyboard artist should provide you with many ways to explore creativity and imagination. With alignment and backing from your church’s leadership, you possess some powerful tools that enable you to provide variety and creativity in your church’s expression of worship. Ultimately, our goal is to exalt the greatness of our God (Psalm 145:3). In all you do–no matter how creatively or imaginatively–may that remain your top priority. Simplified piano accompanying is not something new or original with me. A lot of people are teaching this concept these days. Bob Kauflin, and many others who lead worship with a band, emphasize the importance of utilizing the keyboard in a way that enhances the mix, and doesn’t draw attention to itself. (Many are even minimizing the role of the accompanists in an effort to emphasize the actual singing of the congregation, which is a great trend!) But I’ve found that this technique, while necessary and appropriate in a praise band setting, also works very well in a more traditional setting (which is what I’m more familiar with). If you’re the only accompanist for the congregational singing, I suggest you take this tip with a grain of salt. Sometimes, what you play (or don’t play) will make the difference between the congregation feeling very confident and singing out, versus them feeling uneasy and possibly even derailing the song. Your goal as an accompanist is to build confidence and provide support. Another factor involved is how long you’ve been their accompanist, and how well the people are used to you. If you’re a newbie, you’re going to want to take every precaution to ensure your playing is super supportive. But if you are fortunate to play with other instruments (an acoustic band or a church orchestra), or your church is a four-part-harmony-singing type of church, you might find it helpful to simplify your accompaniment to compliment the ensemble or the singers. Let me give you a few examples. 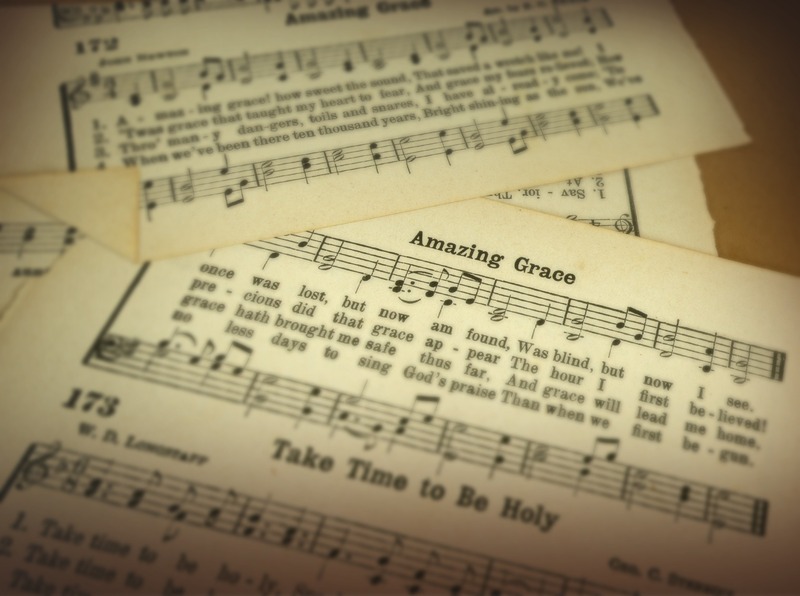 Here we have a pretty basic rendition of Amazing Grace, built on the harmonies found in the hymnal. This will work well with playing with a church orchestra. In example 2, you’ll find a much stronger bass line. I will often incorporate this style, especially if we don’t have adequate representation of the bass section (either brass or strings). Also, our church’s piano is a 9′ concert grand; those bass notes resonate beautifully and powerfully. Example 3 emphasizes the mid-section, and also provides some momentous movement in the left hand. (Movement helps maintain momentum, or keep a lagging group moving forward. But be careful. Too much movement–sixteenth notes and such–can slow things down.) This rendition works well when your highs and lows are represented well in the church orchestra. It also works well when you’re the only accompanist, or one of a few. Now things are starting to get exciting. Example 4 shows how you can eliminate some melody notes, and still provide support and momentum. Let’s face it, most people know this song really well. So the melody on beat 3 of the first full measure is not necessary. Notice the right hand pattern in the second full measure. It grows out of the harmonies of the chord, and provides the movement while the voice holds a half note out. Example 5 will actually only (best) work when you are the only accompanying instrument, mainly because we’re beginning to steer away from the harmonies found in a hymnal. If you are playing with an organ, or with an orchestra, or with four-part singing, this option likely won’t work. It will work best for congregations that are used to singing melody, or used to occasionally singing in free form. Go ahead and hum the melody while you play through this example. The second full measure is really exciting to me. It not only helps continue to maintain momentum, but it builds into the next measure. Notice I removed the E minor chord on beat 3 of the third measure. It occurred to me that you’re beginning to see the thought process that goes into arranging music. A pattern like this would work well for accompanying a soloist (vocal or instrumental) on this song. Even while simplifying, great interest has been added. Now let’s have some fun. Again, hum through the melody while playing this example. You won’t be able to get away with this pattern for a whole stanza, but you might be able to maintain it throughout the first half. It’s very open sounding, almost ethereal. This will also work well when you want a stanza to be very reflective. Since we’re getting crazy, have a look at this fun example. This is obviously very open and sustained. It will work in very few contexts. Our congregation follows a song leader who is confident and inspiring. Vocally, he can keep the momentum. That being the case, I might have liberty to experiment with options such as this. It wouldn’t be common, however. Hopefully, whatever you decide to do, you will provide the congregation support, and you will enable the most important thing about congregational singing to be emphasized: the singing itself. A neat aspect of church music ministry is when a song migrates from choir anthem to congregational song. It can happen when a song becomes well-known and well-loved by choir members and congregants alike. It’s not always planned that way. In fact, sometimes it’s surprising. When a song resonates so well with a congregation, it’s really a neat thing to observe. Our church has experienced this with several songs, including an arrangement of “Hallelujah to the Lamb,” the Getty hymn, “In Christ Alone,” a Kirkland arrangement of, “Worthy of Worship,” and many others. I’m honored that one of my own arrangements, “Amazing Grace (My Chains are Gone),” has also made the jump from the choir loft to the pew. Since the congregation is already familiar with them in a corporate worship setting, they will be able to “pick them up” easier. You are providing a unique worship opportunity that your congregation wouldn’t otherwise be able to participate in. It sends a subtle message validating the primacy of the congregational singing ministry of the church. It adds a new, enjoyable way for your congregation to worship, which can in turn lead to more vibrant singing and a more dynamic service. Have you tried this? How has it worked? In other words, how easy is it to sing? When introducing a song to a group of individuals with varying levels of music ability, you’ll have better success with a simpler melody. I’m a big fan of hymnals. In fact, you could say that I casually collect them. If you were to walk into my office and glance at my bookshelves, you would notice what could probably be described as a fairly large collection of them.